Google has added support for Cinema 4D and Houdini to Zync Render, its online rendering service. The firm is also adding support for GPU computing to the underlying Google Cloud Platform. Previously an independent service based on Amazon’s EC2 cloud, used by studios including Atomic Fiction, Zync was acquired by Google in 2014, and relaunched last year using its own Google Cloud Platform. The latest announcement brings the total of DCC applications Zync Render supports to four, Maya and Nuke having been supported since launch. 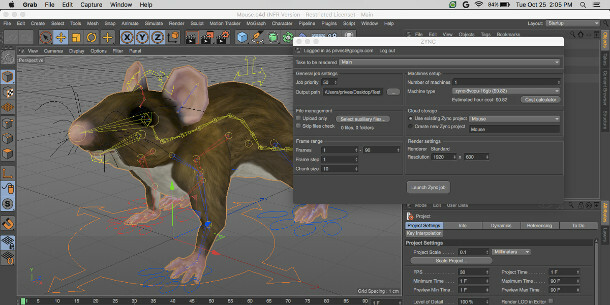 Cinema 4D users can render in the cloud with the software’s native Standard and Physical renderers; Houdini users get the choice of the native Mantra renderer or Arnold. In separate news, Google is adding GPU computing support to Google Cloud Platform, with both Nvidia’s Tesla K80 and P100 and AMD’s FirePro S9200 x2 GPUs due to become available next year. Initially, GPU support will only be available for Google’s Compute Engine and Machine Learning services. However, Google specifically namechecks rendering – of video, at least – as an example of a task that benefits from GPU support, so it isn’t too much of a stretch to see it being rolled out to Zync in the future. Zync Render is available now. The platform supports Cinema 4D R18, Houdini 15.0+, Maya 2014+ and Nuke 8+, along with the Arnold, RenderMan and V-Ray renderers and GenArts’ Sapphire plugins. Pricing starts at $0.54/hour for Cinema 4D running on an eight-CPU virtual machine. See price details here.